LMB Brake Pad Wear Sensors replace the traditional metal squealer shims found more commonly in older or cheaper braking systems. The wear sensors are designed to break or complete a circuit once the brake pad has worn enough for the sensor to contact the brake rotor. A warning light will usually light up on the dash, indicating it’s time for a brake pad change. As brake pad wear sensors are designed to break or complete a circuit by contacting the brake rotor, they aren’t a reusable item. As a result brake pad wear sensors should be replaced with every brake pad change. 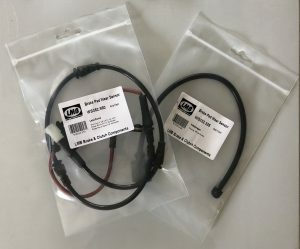 Original LMB Brake And Clutch Components supplies brake pad wear sensors to suit a wide range of vehicles.